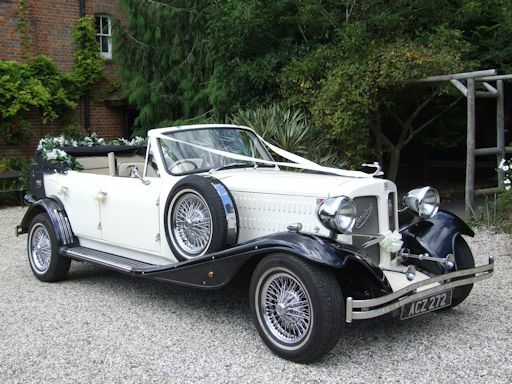 The 1920’s Bramwith 6 Seater Vintage Convertible Bridal Car is our pride and joy. Affectionately know as Mr B he has the capacity to make everyone smile on your wedding day. 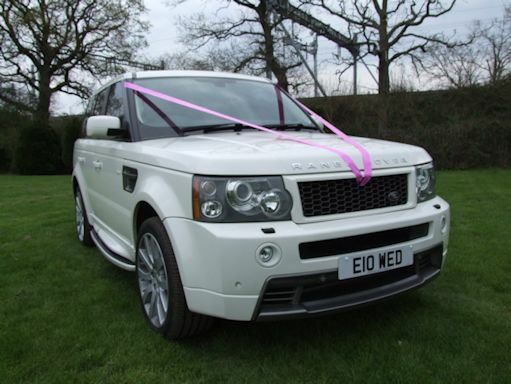 The Bramwith is the car that inspired Always Chauffeur to set off on the road of providing our outstanding wedding car and chauffeur service. 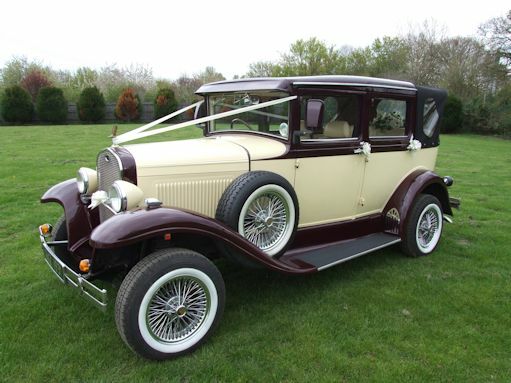 Mr B’s Vintage looks make him a truly impressive wedding car that we will make a real statement on your wedding day. The 6 seater limo wedding car is very popular as you can save money by hiring one car for the entire bridal party. The doors open fully back and the spacious interior provides you with plenty of room for your Wedding dress. The back of the Bramwith limo wedding car has two permanent bench seats (not fold down occasional seats), which face each other, and are finished in beautiful cream leather. The rear part of the roof, of the Bramwith limo wedding car folds down so that it becomes open top giving it that classic vintage convertible look and feel. The hood can be taken up or down in minutes, which is ideal with the unpredictable English weather!! 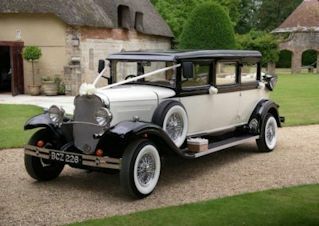 Now we even have his little sister ‘Belinda’ The 4 Door Beauford who has the same elegance and style who loves to go out on her own or with her big brother for those larger family weddings. Thank you so much Natalie for the use of your Bramwith car for our wedding. The car was beautiful and we had numerous compliments from guests on the beauty and the quality of the car. The car was perfect for what we wanted for the day as not only did it accommodate myself, my father and three bridesmaids on the way to the church and it allowed ample space for me (with a rather large dress) and my husband on the way to the reception. To say the car was superb was an understatement! It added to the fantastic day and was brilliant for photos. Natalie looked the part and was extremely helpful, taking photos and bringing brolly’s in case!! We would, without doubt recommend Always Chauffeur and would use their services again in the future.